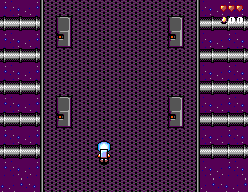 Galactic Revenge is a Sega Master System homebrew game by eruiz00. It’s the year 33XXX. Dirty aliens from a faraway galaxy emptied your refrigerator and killed your boyfriend. Confident in their superiority, they also had the nerve to steal your beloved Master System. Get your blastin’ shoes on and pick from three killer outfits. Wield fire, spread shots, lasers, and even shurikens. Wipe the grins off their faces as you jump, shoot, and fight your way through their ship and turn them into scrap as payback for their heinous deeds!